Lashkary, A., Karimi-Shahabi, R., Hashemi, T. (2016). The role of metacognitive beliefs in depression: Mediating role of rumination. International Journal of Behavioral Sciences, 9(4), 13-18. Arezoo Lashkary; Rogayeh Karimi-Shahabi; Touraj Hashemi. "The role of metacognitive beliefs in depression: Mediating role of rumination". 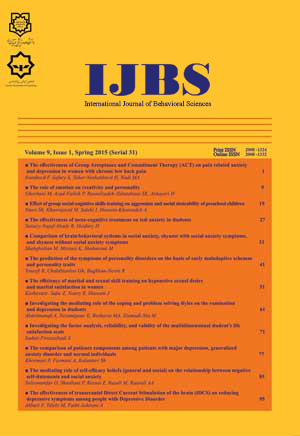 International Journal of Behavioral Sciences, 9, 4, 2016, 13-18. Lashkary, A., Karimi-Shahabi, R., Hashemi, T. (2016). 'The role of metacognitive beliefs in depression: Mediating role of rumination', International Journal of Behavioral Sciences, 9(4), pp. 13-18. Lashkary, A., Karimi-Shahabi, R., Hashemi, T. The role of metacognitive beliefs in depression: Mediating role of rumination. International Journal of Behavioral Sciences, 2016; 9(4): 13-18. Introduction: The aim of the present study was to investigate the role of metacognitive beliefs in depression by the mediating role of rumination.Method: The present study was conducted with a correlational method. Therefore, 275 students of the University of Tabriz were selected using a stratified sampling method. Beck’s depression inventory, Wells’ metacognitive questionnaire and Treynor’s rumination questionnaire were used for data collection. Data were analyzed by path analysis using the LISREL Software.Results: The results of the present study indicated that there was a positive relationship between positive and negative beliefs of worry and rumination schemas. Besides, there was a positive relationship between these beliefs and depression. Regarding to the fitness Indexes, the mediating role of rumination in the relation between positive and negative metacognitive beliefs and depression was confirmed.Conclusion: Based on the findings of the present study, it can be proposed that depression could be influenced by dysfunctional metacognitive beliefs (positive and negative beliefs about worry) through different paths. Such effects are intensified by dysfunctional schemas such as rumination. Hence, positive metacognitive beliefs are considered as a trigger for the application of rumination as an incompatible coping style for depression. Diagnostic and statistical manual of mental disorders(5 TH). Washington, DC: American Psychiatric Association; 2013. Sadock BJ, Sadock VA. Kaplan & Sadock's Comprehensive Textbook of Psychiatry. USA: Lippincott Williams & Wilkins; 2007. Kessler RC, Berglund P, Demler O, Jin R, Koretz D, Merikangas KR, et al. The epidemiology of major depressive disorder: results from the National Comorbidity Survey Replication (NCS-R). JAMA. 2003;289(23):3095-105. Fried EI, Nesse RM. The impact of individual depressive symptoms on impairment of psychosocial functioning. PLOS One. 2014;9(2):e90311. Reyes-Rodriguez ML, Rivera-Medina CL, Camara-Fuentes L, Suarez-Torres A, Bernal G. Depression symptoms and stressful life events among college students in Puerto Rico. J Affect Disord. 2013;154(3):324-30. Wells A. Emotional Disorders and Metacognition: Innovative Cognitive Therapy. New Jersey: Wiley; 2000. Wells A. Metacognitive Therapy for Anxietyand Depression. New York: Guilford Press; 2009. Wells A, Matthews G. Attention and emotion: A clinical perspective. Hove: UK, Erlbaum; 1994. Shull AM. Rumination mediates the impact of personality on the development of depression during the transition to college. Michigan: University of Michigan; 2014,Nolen-Hoeksema S, Wisco BE, Lyubomirsky S. Rethinking Rumination. Perspectives on psychological science. Psychol Sci. 2008;3(5):400-24. Joormann J. Differential effect of rumination and dysphoria on the inhibition of irrelevant emotional material: Evidence from a negative priming task. Cognit Ther Res. 2006;30:149- 60. Bagby RM, Rector NA, Bacchiochi JR, McBride C. The stability of the response styles questionnaire rumination scale in a sample of patients with major depression Cogn Ther Res. 2004;28(4):527-38. Nolen-Hoeksema S. Responses to depression and their effects on the duration of depressive episodes. J Abnorm Psychol. 1991;100(4):569-82. Nolen-Hoeksema S, Morrow J, Fredrickson BL. Response styles and the duration of episodes of depressed mood. J Abnorm Psychol. 1993;102(1):20-8. Lyobomirsky S, Tkach S. the consequences of dysphoric rumniation. In :Papageorgiou C, Wells A. Depressive rumniation, nature, theory, and treatment. Chichester: Willy; 2004. McLaughlin KA, Nolen-Hoeksema S. Rumination as a transdiagnostic factor in depression and anxiety. Behaviour research and therapy. Behav Res Ther. 2011;49(3):186-93,Fresco DM, Frankel AN, Mennin DS, Turk CL, Heimberg RG. Distinctand overlapping features of rumination and worry: the relationship of cognitiveproductiontonegative affective states. . Cogn Ther Res. 2002;26:179-788. Surrence K, Miranda R, Marroquin BM, Chan S. Brooding and reflective rumination among suicide attempters: cognitive vulnerability to suicidal ideation. Behav Res Ther. 2009;47(9):803-8. Joormann J, Dkane M, Gotlib IH. Adaptive and maladaptive components of rumination? Diagnostic specificity and relation to depressive biases. Behav Ther. 2006;37(3):269-80. Treynor W, Gonzalez R, Nolen-Hoeksema S. Rumination reconsidered: A psychometric analysis. Cognit Ther Res. 2003;27:247-59. Burwell RA, Shirk SR. Subtypes of rumination in adolescence: associations between brooding, reflection, depressive symptoms, and coping. J Clin Child Adoles Psychol. 2007;36(1):56-65. Lo CS, Ho SM, Hollon SD. The effects of rumination and negative cognitive styles on depression: A mediation analysis. Behav Res Ther. 2008;46(4):487-95. Just N, Alloy LB. The response styles theory of depression: tests and an extension of the theory. J Abnorm psychol. 1997;106(2):221-9. Wells A, Cartwright-Hatton S. A short form of the metacognitions questionnaire: properties of the MCQ-30. Behav Res Ther. 2004;42(4):385-96. Shirinzadeh Dastgiri S, Goodarzi MA, Rahimi C, Naziri G. Study of factor atructure, validity and reliablity of metacognition questionnaire-30. J Psychol. 2009;12:445-61. Osman A, Barrios FX, P.M. G, Williams JE, Bailey J. Psychometric properties of the Beck Depression Inventory-II in nonclinical adolescent samples. J Clin Psychol. 2008;64(1):83-102. Ghassemzadeh H, Mojtabai R, Karamghadiri N, Ebrahimkhani N. Psychometric properties of a Persian-language version of the Beck Depression Inventory-Second edition. Dep Anx. 2005;21(4):185-92. Papageorgio C, Wells A. depressive rumination: nature, theory, and treatment. Chichester, UK: Willy; 2004. Papageorgiou C, Wells A. metaconitive beliefs about rumianation in recuurent major depression. Cogn Behav Pract. 2001;8:160-4. Segerstrom SC, Tsao J, Alden LE, Craske ME. worry and rumination: Repetitive thought as a concomitant and predictor of negative mood. Cogn Ther Res. 2000;24:671-88.